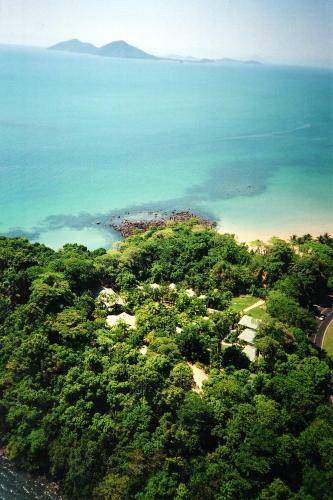 Lock in a great price for Eco Village Mission Beach – rated 8.9 by recent guests! I loved the decor, the layout, the location, the peace and quiet. I felt like I was being spoilt when I was on a work trip! Such a beautiful place. 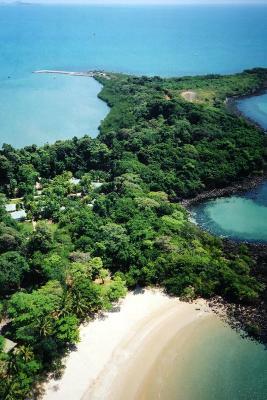 The property is located in a beautiful bay. The bungalows are spacious, comfortable and equipped with small kitchenette facilities. Comfortable bed. Good Air-Cond. 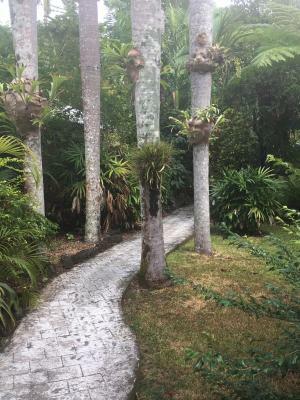 Good environment, calm and very well kept gardens. The beach is just in front, 10m from the swimming pool. The swimming pool is large and very well decorated. LIsa is extremely nice and helpful. The location is perfect for some days rest. This was our 4th stay and we'll be back again. Great facilities, location and lovely meal at the restaurant. The whole eco village was tucked nicely away from any of the other hotels, which was lovely for a quiet getaway. It had its own path to the beach which was excellent. Apartment was big, lots of spare space, with a spa bath. Environment and beach great. Unit was clean and well kept. staff were there when you need them. Really relaxing stay. Beautiful area, big, clean room. Very comfortable bed, nice and quiet. Wonderful place to get away from it all. Staff is really helpful. Nice little gem off town centre. Nice setup with an onsite restaurant, shortcut to quiet end of the beach, and little pool to cool down in. 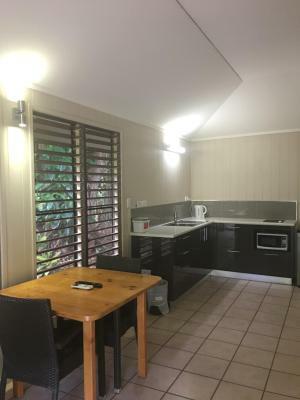 Eco Village Mission Beach This rating is a reflection of how the property compares to the industry standard when it comes to price, facilities and services available. It's based on a self-evaluation by the property. Use this rating to help choose your stay! 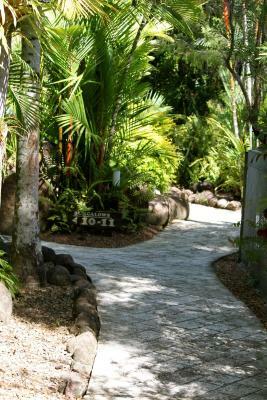 The self-contained bungalows at Mission Beach Eco Village surround the swimming pool area. The deluxe rooms are located in their own secluded area overlooking private water features. 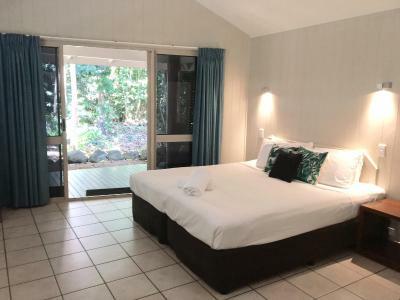 Each air-conditioned bungalow features ceiling fans, a 32-inch LCD TV and a front patio with outdoor furniture overlooking the pool area, gardens or coastal rainforest. 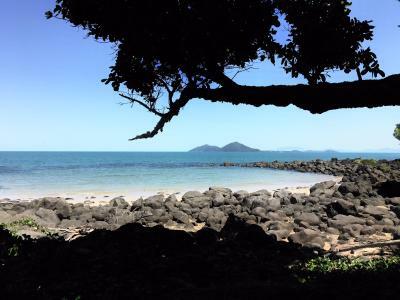 The restaurant and bar overlook the ocean towards Dunk Island and are open for dinner from Thursday to Saturday in peak season, and from Friday to Saturday in low season. The tour desk can arrange local activities, with cruises to Dunk Island departing from the front door. 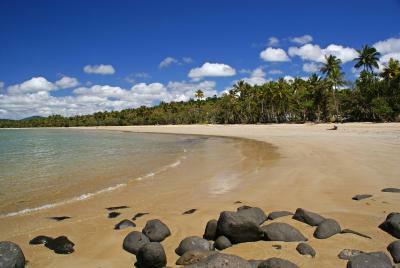 Eco Village Mission Beach Australia is a leisurely 10-minute stroll along the beach from shops, restaurants and bars. When would you like to stay at Eco Village Mission Beach? 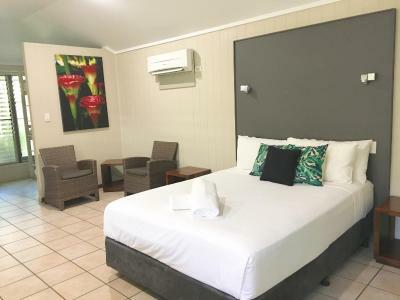 This room has a queen-sized bed, a single-sized bed and a kitchenette with tea/coffee making facilities, a microwave, toaster, sink, cutlery, crockery and a refrigerator. It also includes a hairdryer, 2 lounge chairs, ceiling fans, a desk and ironing facilities. All deluxe rooms have a private balcony overlooking it's own tropical water feature. Please note that children and infants cannot be accommodated in this room type. This room features a large corner spa bath in the main area with a king-sized bed. It also includes air-conditioning, an private bathroom, tea/coffee making facilities, a refrigerator, hairdryer, 2 lounge chairs, a desk and ironing facilities. 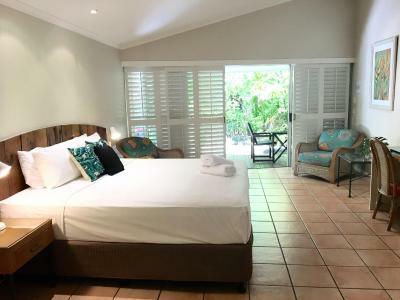 All deluxe rooms have a private balcony overlooking a tropical water feature. This free-standing spa bungalow is self-contained and features an private bathroom with a spa bath. 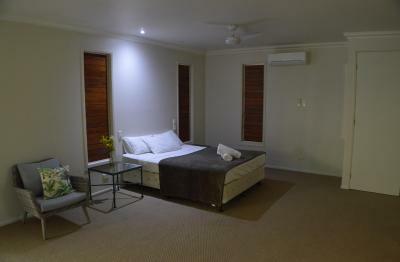 The spacious studio, offers a king-sized bed or 2 single-sized beds. It also includes air-conditioning and a fully equipped kitchen with a refrigerator, toaster, kettle, cookware, microwave, stove top and utensils. Seating and dining area with a 32-inch LCD TV. This room offers a patio with outdoor furniture. There is a fully equipped kitchen with a large refrigerator. There is a 32-inch LCD TV and a coffee table. Please note that the price is based on 5 guests. Maximum occupancy is 2 adults and a maximum of 3 children. Total capacity is 5 (see Hotel Policies). This spacious 2 room bungalow features a queen bed in the main living area, 2 bunks in a separate area and a private bedroom with 1 king and 1 single bed. Both rooms are are air-conditioned. 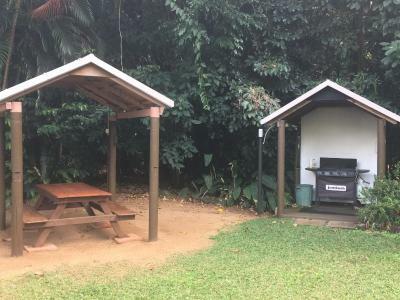 The bungalow has an private bathroom and a fully equipped kitchen with a refrigerator, toaster, kettle, cookware, a microwave, utensils and a stove top. There is a seating and dining area with a 32-inch LCD TV. The front deck has a table and seating, overlooking the lagoon-style pool. Please note that this room will only be serviced mid-stay for stays of 5 nights or more. Fresh towels are available for free daily. This private, free-standing, spacious bungalow features a queen-sized bed and 3 bunk beds in a separate partitioned area. It also includes air-conditioning, an private bathroom and a fully equipped kitchen with a refrigerator, toaster, kettle, cookware, utensils, a microwave and a stove top. It has a seating and dining area with a 32-inch LCD TV. Features a private balcony overlooking the tropical lagoon-style pool. House Rules Eco Village Mission Beach takes special requests – add in the next step! Eco Village Mission Beach accepts these cards and reserves the right to temporarily hold an amount prior to arrival. Please inform Eco Village Mission Beach of your expected arrival time in advance. You can use the Special Requests box when booking, or contact the property directly using the contact details in your confirmation. No foxtel was the only disadvantage we found . It could have been a bit cleaner. Attention to detail - doors, light switches - that’s all I’m saying. Only minor issue is that the rooms aren’t made up daily, which wasn’t explained at check in. No biggy though. Excellent location, really nice room. - though a bit dated - and great pool. We had dinner on Friday night and expected it to be average, but it was excellent. I’ve paid much more for much worse. Have stayed there before. Friendly quite and comfortable. The Wi-Fi is sometimes very slow. Clean tidy up to date villas. I wanted to go to the eco villge for while now and ended up being a group of 3 couples staying in seperate villas. The distance from the beach was perfect. And having ur own villa with a spa was even better this met all my expectations of the eco village Perfect little getaway with a little but of romance. Ths staff were lovely and the resturant was fabulous, great food and not expensive. The rooms have a real resort feel, will definately return. Our fridge was rusty and leaked a little... time for it to be replaced. Wonderful to be submerged in the rainforest environment. The on site restaurant is exceptional and the staff very friendly. Make sure you have dinner there! The pool is realy great. The restaurant excelent. 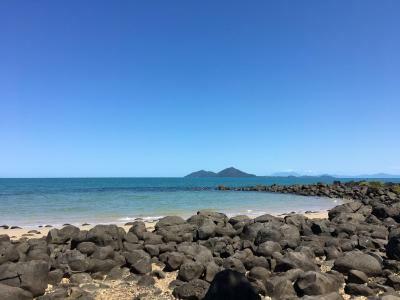 All staff were extremely pleasant, welcoming and reassuring as we stayed during a time when monsoon rains caused flooding and traffic disruptions throughout the north Queensland coastal areas.